Having an ankle sprain severely limits your ability to move around, exercise, and participate in sports. A foot doctor can give you the treatment you need to get back on your feet and in motion after an ankle injury. Get help with the healing process from Dr. Henry Slomowitz at his offices in Paterson and Paramus, NJ, serving Hackensack and Ridgewood. An ankle sprain occurs when there is some kind of trauma to the ankle. This may be due to turning or twisting the foot out of place, falling on the ankle, or jumping and landing in an uncomfortable way. A sprain is damage to the ligaments of the ankle. Athletes and runners are prone to ankle sprains because of their high level of activity and swift movements. An ankle sprain can also happen from falling to the side while wearing high-heeled shoes. The severity of a sprain will vary depending on a number of factors, including past injuries and ankle instability. - Compression bandages to aid healing and support the ankle. - Elevation of the foot and bed rest. - Ice therapy to reduce swelling. - Physical therapy and exercises. - Crutches to keep pressure off the affected foot. - Ligament surgery in extreme or recurring cases. - Ask your podiatrist to show you how to wrap your foot in advance of athletic activity. - Wear better, more supportive footwear when exercising, running, or walking. - Ice your foot each evening when you come home from walking, running, or participating in athletics. A foot doctor can help you take your first step to healing from an ankle sprain. Call (973) 684-1011 or 201-599-9255 today to schedule an appointment with Dr. Henry Slomowitz in Paterson and Paramus, NJ, and serving Hackensack and Ridgewood. New York Jets athlete Dee Milliner has recently sustained a high ankle sprain. While details of the diagnosis have not yet been revealed, the swelling’s severity indicates that the sprain may be a Grade 2. The cornerback may therefore potentially be out for four to six weeks. Due to his condition, Milliner will unfortunately have to miss the first game of the team’s regular season. The Jets are likely to call on Antonio Allen and Ellis Lankster as cornerbacks for the time being. Rex Ryan, the Jets coach, stated, “We feel confident that it’s healing nicely,” when describing the condition of Milliner’s ankle. Sometimes the proper healing of an ankle sprain will require the assistance of a professional. If you are suffering from a sprained ankle, see Dr. Henry Slomowitz of Paramus and Paterson. Dr. Slomowitz will attend to all of your foot and ankle needs and provide you with quality treatment. Treatment of a sprain depends on the severity. Many times, people are told to rest and remain off their feet completely, while others are given an air cast, which will allow you to walk while stabilizing the ankle. During a regular floor routine, junior and gymnast Ally Riedel suffered a Lisfranc fracture in which her metatarsal bones were displaced from the tarsus. The tumbling pass, finishing with a double backflip in pike position was a normal move that she’d completed hundreds of times; however, this particular time the unexpected mishap came mid-flip. She found that her body counter-rotated with her momentum and twisted, not landing normally in a two-footed position. Getting back into a sport after a recent injury can be daunting—unless you have someone guiding you on the safest, healthiest path. It is recommended you speak with a podiatrist like Dr. Henry Slomowitz of Paramus and Paterson. Dr. Slomowitz can offer expert advice and help you recover from your sports injury. In addition, athletes should consider wearing an ankle brace in order to keep the ankle stabilized and alleviate any pain as it heals. Stress fractures that occur in the foot and ankle come in two types. This includes stable and displaced. Stable stress fractures do not consist of any shifting in bone alignment while displaced stress fractures involve bone ends that do not line up. Learn more about getting back into sports after foot and ankle injury by following link below. If you have any questions, feel free to contact our offices in Paramus and Paterson, NJ. We offer the latest in diagnostic and treatment technology to suit your needs. 21 year old dancer Elizabeth Mick performed the Eugene Ballet’s touring production of “The Nutcracker.” Mick, who is a graduate of Lewis and Clark High School, describes her experience has been ‘amazing’ despite undergoing a series of setbacks which included a severe ankle sprain and surgery. Mick joined the Eugene program only after undergoing surgery to remove an ankle cyst that developed after suffering a sprain that forced her to leave early from the Pittsburgh Ballet Theatre’s Graduate Program. If you believe you suffered a sports related foot or ankle injury, you should pay a visit to podiatrist Dr. Henry Slomowitz of Paramus and Paterson. Dr. Slomowitz will provide you with the best care for your feet and ankles. Sports-related injuries are commonly treated using the RICE method. This includes rest, applying ice to the injured area, compression and elevating the ankle. More serious sprains and injuries may require surgery, which could include arthroscopic and reconstructive surgery. To learn more about sports related foot and ankle injuries, please follow link below. Read more on Sports Related Foot and Ankle Injuries. Atlanta Braves player Tim Hudson fractured his ankle on the field during a game against the New York Mets in Citi field. 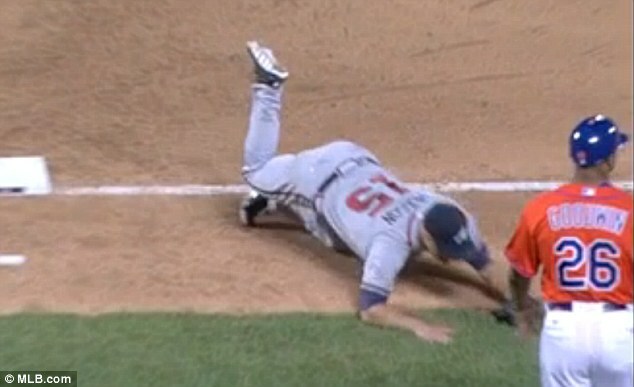 Hudson suffered the injury during the eighth inning, falling to the ground immediately. A broken ankle can be a tough injury to endure and can cause one a great deal of pain. If you have broken your ankle, you should seek the help of a podiatrist like Dr. Henry Slomowitz of New Jersey. Dr. Slomowitz can assess your injury and provide you with the best care for your feet. A broken ankle is experienced when a person fractures their tibia or fibula in the lower leg and ankle area. The tibia is the bone of the lower leg that is known to be the weight-bearing bone and is also more commonly called the shin. The fibula is the bone that is found on the outside of the leg and is smaller than the tibia. These bones are both attached at the bottom of the leg and combine to form what we know to be our ankle.